IDRT is dedicated to improving the lives of people with disabilities, their families, and service providers through research and development, training, technical assistance, and advocacy. Although our work benefits people with all disabilities, we specialize in research and development efforts on behalf of children and adults who are deaf and hard of hearing. We have particular expertise in the development of American Sign Language (ASL)-accessible computer software and other assistive technology products. IDRT is a woman-owned small business. Approximately one-third of the staff is deaf. Because of our training, backgrounds, and experiences, we have an in-depth knowledge about the needs, interests, and expectations of our consumers. Our unique competitive advantage lies in the combination of our research and personnel expertise in the fields of Deaf Education and ASL, our technical expertise in turning this research into product, and our business expertise and relationships with investors, entrepreneurs, and distributors. Over the past 30 years, IDRT has created 60+ assistive technology products for the benefit of people with disabilities, their families, and service providers. IDRT has successfully conducted research and development efforts under grants and contracts with such agencies and companies as the National Science Foundation, the US Department of Education, the National Oceanic and Athmospheric Administration (NOAA), the National Aeronautics and Space Administration (NASA), the US Agency for International Development (USAID), AT&T, and WorldVision. myASLTech.com is an on-line portal that hosts IDRT’s comprehensive suite of ASL tools and 3rd party content, such as the mySign Generator, myASL Publisher, and myASL Quizmaker. The AcceleGlove™, coupled with IDRT’s gesture recognition software, can capture static and dynamic hand⁄finger positions and gestures. The primary application is as an input device for translating American Sign Language hand gestures to English text and speech. Other applications include a military or medical first responder communication system, a controller for consumer electronics, robots, and video games, and the technology can be expanded to capture all body movements for sports training and physical therapy applications. Through our vast ASL product portfolio and experience, IDRT also assists companies and organizations of all sizes enhance deaf and hard of hearing customer experience, as well as meet Americans with Disabilities Act (ADA) requirements for deaf and hard of hearing people. Among our accomplishments, Paws Signs Stories (a.k.a. ASL for Kids) won a Codie Award for Best Special Needs software, and the accompanying storybooks won Best in Category for Excellence in Print from the Printing and Graphics Communications Association. 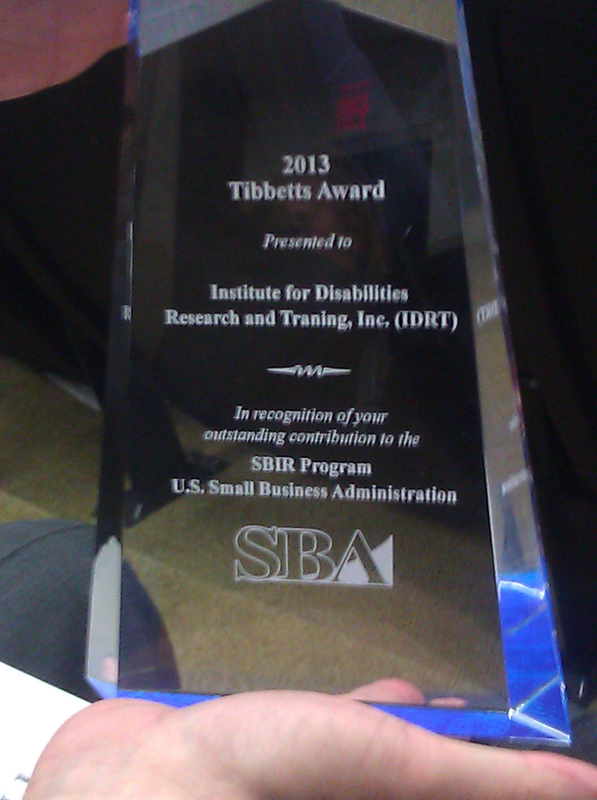 IDRT was presented with a Tibbetts award on 2013 at the White House by the Small Business Administration (SBA) for being a model of excellence for the Small Business Innovative Research (SBIR) program. myTTY 3.0, a software product that allows computers to communicate with TTYs without a special modem, has been an industry standard since 1993 when its development was first funded.